Ask fellow campers about "Ashaway RV Resort" and nearby attractions. We were in site 138 with our 40 ft 5th wheel, very difficult to get in to and we couldn't back into the site all the way or our rv would have been over the neighbors fire pit in the back. Site was uneven and extremely narrow so we couldn't even use our fire pit since it was under our awning. Barely room to park the truck and once again it was pulled in right next to the fire pit. The dog park (small and large area) was so small that my two medium size labradoodles would not be able to even run and chase a ball. Although, there was a nice rec field down in the back and never anyone there in the morning so I took them down there to play. The pool/hot tub/water park area was very nice as was the tennis/pickleball court. People in the office were very nice. There were some nicer, longer, wider sites in the park and some pull-throughs that were a good length. I would go back to this park if I could stay in a different site. We camped at Ashaway RV Resort in a Fifth Wheel. Westerly beaches and Watch Hill are all close by. Nice large park with good level sight. Laundry was very reasonable $1.50 load, dryer $1.00 but only three machines which is not enough for such a large park. Sites were gravel with grass on the patio. The road in dirt so your vehicle get very dusty going up and down. Didn't use there WiFi. About 15 minute drive to beautiful Westerly and an hour to Newport. We camped at Ashaway RV Resort in a Motorhome. The Grey Sail Brewery was the best in the area. It had a better range of beer and has a Pizza oven in there grounds. The town of Westerley was so pretty. Mystic was very crowded and hard to fine parking. Watch Hill was also very busy and its $8 to use that beach plus paying for parking. We did walk down to the lighthouse at Watch Hill. We're here as part of a Caravan. Newer park, the roads are rough, gravel. The sites are gravel and grass. Decent spacing between lots. Appears that seasonal have all the premier spots that back up to the trees. Full hook up, lots of amenities, in a few years when trees have grown up it'll be a nicer park. We camped at Ashaway RV Resort in a Travel Trailer. Sites are very nice, large, level, electric, sewer. Water pressure very good. Campground is still being built out, and the trees at the sites are very small. Mini golf being added. Pavilion nice too. Pool is nice but small for the size of the campground and only 3' deep. Would have been nice to have more organized events for the kids. Great location to the beaches. This was our second time staying here. Lower level sites are nicer and flatter than the upper level sites. We heard they are going to convert the campground to seasonal only in the future. We camped at Ashaway RV Resort in a Travel Trailer. Watch the water pressure. This was one of the few campgrounds where the pressure was high. If you don't have a regulator you could damage your campers internal pipes. Key card has a $20 deposit. This is a fairly large park converted from a field. They have a lot of amenities which we didn't use. The sites are gravel with grass in between. A bit of dirt due to allowing outdoor rugs. We were pretty level and most were but there were some sites that had side to side issues. The space between sites was OK. Not too tight but not spacious. Wi-Fi was good, water and electric were fine. I gave the low score because of our initial introduction upon registration. We had called several days ahead asking if we could have mail sent there and they said yes. (The mail was medications). We arrived on Saturday and leaving on Monday. When we got there I asked about the mail and they had not gone to the PO to get it and it was probably closed. I explained the situation and the park handyman was too busy sitting on his stool to go get it or care and the woman behind the desk couldn't leave or make the phone call to the PO. We ended up doing a quick parking job in our site and ran to the PO. Yes, they were closed but the postmaster was still there and was happy to help. I found this lack of customer service to be rude and uncaring. For $64 a night (before passport America) they really should have a care for their guests. We camped at Ashaway RV Resort in a Fifth Wheel. We paid the Passport America rate of $29.50 per night for a 50 amp FHU pull thru site with cable and wifi. Good value with Passport America, but I don't think I would pay full price. The site was mostly level, but did have some grade at the back end of it. All utilities were good, cable lineup had 32 very clear stations. Wifi was very good with a computer, but our Galaxy smart phone did not care for it. Office staff was very nice and helpful. We came in early as we had just left a 9 am service appointment in nearby CT. The staff was great in accomadating us. They do have gated access here, so you will need a refundable $20 for the access card. As mentioned before, the only real complaint here is that the roads can get very dusty. We would return again if in the area. We camped at Ashaway RV Resort in a Motorhome. So many campgrounds describe themselves as a resort. Obviously Ashaway is still a work in progress. 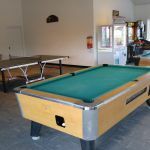 The owners have invested in "fun" things and have a nice pool and large event building. 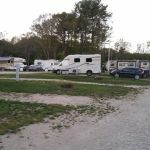 During our stay, there were many more travel trailers and fifth wheels staying there than motorhomes. Access road into the campground was dirt and stone and was very dusty. Directions to our site were confusing especially without better marking of site numbers. Sites were not paved and felt rather tight. Our site had very little grass (mostly sandy soil) on the entry side of the motorhome. Hard to keep dirt outside. Given time this park may evolve to be classified as a "resort" but this reviewer believes it fell short of that description. We camped at Ashaway RV Resort in a Motorhome. Provided reasonably good range of access to CT and RI tourist locations. The park is huge and dusty with many, many seasonal residents. They were all very nice and had some nice setups. Getting our 43 footer to the site was very challenging as the roads and turns are tight. Our site was not level so our front end was way off the ground making it hard to make that first step. The pool was nice but super packed with kids so not very relaxing. There is a large athletic field where we could play ball with the dog as the dog park itself was quite small. This park supported our needs but I doubt we would return. We camped at Ashaway RV Resort in a Motorhome. As stated in previous reviews, this is a newer park. The roads can get dusty and there is not much shade yet. Except for those two things, this park was very nice. The staff was excellent and was constantly working on improvements to the park. The park was about 2/3 full and there was very little noise. The facilities and pool were well kept and very clean. The wifi was very good and consistent the entire weekend we were there. Overall we had a great experience at this park and will return in the future. We camped at Ashaway RV Resort in a Fifth Wheel. Not far from Mystic, CT. or casinos. Also convenient to Misquamicut Beach and Westerly RI. We stayed here over the 3 day Labor Weekend and the rate was $240 for the 3 days and the park was very busy. There were many activities for both children and adults including live entertainment in the pavilion. This park is only a couple of years old with easy access and large pads. There is limited shade due to young trees. There is a large section of seasonal sites. We would stay again on a non holiday period with a more affordable rate. We camped at Ashaway RV Resort in a Fifth Wheel. We stayed here to attend a music festival in Charlestown, RI which is only 10 miles away but the trip took at least 1/2 hour each direction due to 25mph roads and traffic. Grey Sail brewery is very good and worth a visit. Ashway is a fairly large, well laid-out RV park with, it seems, about 1/3rd to 1/2 semi-permanent. We lucked out with a pull-through despite our tiny motorhome. The site is very long, gravel and grass, close to each other but not too close, not very level, great hookups, a nice picnic table, a very nice grill/fire-pit but almost none of the sites have any shade. The WiFi here is impressively good. I could also get 2-bars of Verizon 4G signal. Includes cable TV with about 12 channels. The pool is very nice, and they have an adult-only hot-tub, all very clean. The playground area and game room pavilion look new and are quite impressive, including large bathrooms with showers. Laundry has 2 washers and 3 dryers, very clean and reasonable. The management seems very nice, and the store stocks a few items. Access card is $20, refundable upon return. Dirt/gravel road that connects the park to the main asphalt road has a lot of small potholes and can be dusty. Overall, we enjoyed our stay and would stay there again. We camped at Ashaway RV Resort in a Motorhome. Close by there are only a few rural type restaurants, and despite Westerly being so close, it takes quite a long time to get to anything there because of all the 25-mph roads (with attending police cars). Providence is 45 minutes away. We tried Brick Oven (nearby) and 84 Tavern on Canal (in Westerly) and both were only fair. A nearby steakhouse, The Pavilion, is slightly better. Outside of that, this stretch of I-95 has only a few local restaurants scattered around. place is only two years old. Mystic, Groton, New London. Fairly ease off I-95. Easy in and out. working on improvements constantly. We camped at Ashaway RV Resort in a Motorhome. We partook in the campgrounds fall special. Aug. 15 - Oct 15 for $800. Unlimited access to campground and no time restrictions. Able to leave trailer in place and hooked up for duration. Campground has a lot of activities for kids. Daily barrel rides, hay rides, crafts, and games. Pool area is great for kids. Pool is walk in and goes to about 5 feet deep. Adults only hot tub seats 10-12 comfortably. Adjacent to pool is a splash pad for kids. The park does lack shade, but it's manageable. The entire park is new and I was told it was a former quarry. Trees are space but in time will be plentiful. Dirt roads were regraded this year with millings to cut down on dust. New kids club and a community fire pit were built at the end of the year. Wifi towers are all over the place and signal is great. Bingo on Friday nights and usually a DJ or some type of music act on Saturdays. We camped at Ashaway RV Resort in a Travel Trailer. We were in the lower section with a 37 ft, 5th wheel. It was very crowded. Neighbors fire ring was bolted within 2-3 ft of our site. Wifi was intermittent. 5o amp service was great! Staff was very nice and helpful. Park itself was clean and well kept. I feel the pool was too small for amount of people. We will come again, but off season. We camped at Ashaway RV Resort in a Fifth Wheel. Location is great, Beaches close by. Shopping close by. This is a pretty new park so it is in really great shape. The trees are very small since they are fairly young. It is a huge park but doesn't feel crowded. The playground area/pool area are great for kids. They had fun activities for kids. All utilities worked well and our satellite was good. Even their WIFI was great. Sites were fairly level. Probably the only complaint is the road coming in is dirt/gravel and has lots of bumps. They would be out spraying water on it to keep the dust down, but it was very bumpy. They did have a laundry, but there were only 2 washers and 3 dryers for a very large park. Would stay here again if in the area. We camped at Ashaway RV Resort in a Fifth Wheel. We chose this park as a base camp to explore Watch Hill RI, Mystic and New London CT and it turned out to be a good choice. Grocery store and Walmart within 10 miles. Mystic CT is interesting town and about 30 minute drive. Both Newport and Providence are about an hour drive and worth a visit. Watch Hill is a 15 minute drive and worth a visit. Beaches are close but all charge for parking which is fine if you plan to stay all day. Beach and local antiques shops. Mystic Aquarium is great. Are you affiliated with Ashaway RV Resort ?